The perfectly pink contour brush will help transform your face in no time! Add blush or bronzer to your cheeks to create dimension. Create curves by contouring your décolletage and cleavage, and create abs by shading and highlighting. 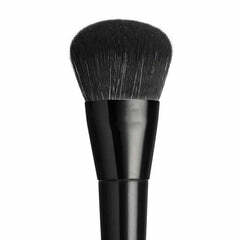 The brush is animal friendly, offering a guilt-free way to enjoy this expertly handmade brush!